Many people ask why our company is called According to "Gospel"... Our company is named for our horse Gospel Hour who developed a severe case of laminitis after a surgery to repair an old injury in 1999. At that time, we were looking for a way to help Gospel, not begin a business, but as word spread, people started to ask us to help their animal friends and Gospel's light pads became a business. Our goal is to provide quality light therapy products that are safe, effective and affordable, great light therapy products for both horse and dog owners and for health care professionals and trainers. I bought mine 6 years for a suspensory ligament injury. Love it! 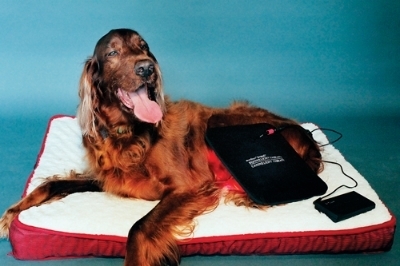 Equine & Canine Light Therapy pads have become a "must have" for many animal owners. Why? They are safe, easy to use, affordable and effective. Since the early '80s, light therapy (sometimes called red light therapy, Phototherapy, LED therapy, DPL, Infrared therapy, Photon Therapy, or Red/Infrared Therapy) has been used in the horse world for treating equine concerns and helping owners and trainers keep their horses in top shape. The first light therapy that was widely used on animals was laser therapy, also called low level laser therapy (LLLT) or cold laser therapy. It has since been reported that light therapy using LEDs produces many of the same benefits as LLLT, but is less costly and much safer. A 1989 study entitled "Low-Energy Laser Therapy: Controversies and New Research Findings", Jeffrey R. Basford, M.D. of the Mayo Clinic’s Department of Physical Medicine and Rehabilitation suggests that the coherent aspect of laser may not be the source of its therapeutic effect. Thus any effects produced by low-energy lasers may be due to the effects of light in general and not to the unique properties of lasers. * LEDs do not deliver enough power to damage the tissue, but they do deliver enough energy to stimulate a response from the body to heal itself. LEDs provide a much gentler delivery of the same healing wavelengths of light as does the laser. LED light therapy is really a way to help the body heal itself. We use specific wavelengths of light that are absorbed by a photo acceptor, cytochrome c oxidase within the mitochondria of the cell. The energy (photons) from the lights increases the energy within the cell and that speeds up the healing process. The lights must be specific wavelengths and must be delivered at a specific dosage. We use two wavelengths in our light therapy pads, a visible red and a near infrared wavelength. Using both red and near infrared lights is beneficial because the wavelengths are absorbed by different depths of tissue. The combination of the two work in concert to provide benefits for soft tissue injuries, inflammation, ligament soreness, tendon problems, sore backs, splints, strains, stifle issues, sprains, swelling, shoulder pain, hip pain, sore backs, sore necks, salivary gland problems, wounds, cuts, scrapes, arthritis pain and for trigger points and acupuncture points. Visible red light (660nm) is absorbed by skin layers very efficiently and is best for uses such as stimulating trigger and acupuncture points and for treating wounds and infections. Near infrared light (880nm) penetrates to a deeper level has been used to treat concerns of tendons, ligaments, bones, joints and muscle. Our Light Therapy pads are available in four sizes and you get everything you need, including the power supply and straps that adhere to the pad with velcro. We offer a rechargeable battery pack as an accessory. We use specific wavelengths, high quality LEDs and our Equine & Canine Light Therapy pads are manufactured right here in the United States. To insure safety for the horse, dog and his human, the cord is not hardwired into the pad, it plugs into the pad and quick releases, if needed. An internal timer turns your pad off after the recommended treatment time of 15 minutes. You can find more information on that on our Products page. This sure worked on our German Shorthair! I was skeptical, being an infectious diseases physician, but her ulcer healed in record time. Now, why should you use it? General: Arthritis pain, bursitis, bruising, burns, edema, deep muscle problems, hematomas, inflammation, tight or sore muscles and infections. Hoof Problems: Abscesses, bone spurs, inflammation, navicular, ringbone and laminitis. Leg and Body: Ankle problems, bone chips, hock problems, inflammation, ligament soreness, tendon problems, sore backs, splints, strains, stifle issues, sprains, swelling, shoulder pain, hip pain, sore backs, sore necks, salivary gland problems, wounds, cuts, scrapes and for stimulating trigger points and acupuncture points. But how does it work and why? **The LEDs at specific wavelengths are reported to increase circulation by increasing the formation of new capillaries. New capillaries speed up the healing process by carrying more oxygen as well as more nutrients needed for healing and they can also carry more waste products away. **Collagen is the most common protein found in the body and the essential protein used to repair damaged tissue and to replace old tissue. Studies cite that LEDs stimulate the production of collagen. It has been reported that by increasing collagen production, less scar tissue is formed at the damaged site. **LED therapy is reported to stimulate the release of adenosine triphosphate (ATP). ATP is the major carrier of energy to all cells and provides the chemical energy that drives the chemical reaction of the cell. Increases in ATP allow cells to use nutrients faster and get rid of waste products faster by increasing the energy level in the cell. **Increases lymphatic system activity. Edema has two basic components, liquid and protein. Research has shown that the lymph vessel diameter and the flow of the lymph system can be doubled with the use of light therapy. This means that both parts of edema can be eliminated at a much faster rate to relieve swelling. **Reduces the excitability of nervous tissue. The light energy stimulates the release of endorphins which are the body's own long term pain fighting chemicals. **May improve peripheral neuropathies by stimulating nitric oxide production. **Increases RNA and DNA synthesis which helps damaged cells to be replaced more quickly. **Increases the process of scavenging for and ingesting dead or degenerated cells by phagocyte cells for the purpose of clean up. This is an important part of the infection fighting process. Destruction of the infection and clean up must occur before the healing process can take place. **Stimulates tissue granulation and connective tissue projections, part of the healing process. **Stimulates trigger and acupuncture points. We have found no reports of adverse side effects regarding LED therapy. It is repeatedly reported that when the cell is "reenergized" it accepts no more energy, so you cannot cause harm and it is reported to have no effect on healthy tissue. The body will not absorb what it cannot use. Caution is urged for those taking photosensitive drugs. Please do not use on pregnant mares unless you are being advised by a veterinarian who is familar with light therapy, we have found no studies citing use on pregnant mares. We have been told that a temporary increase in pain or discomfort may be observed after treating chronic conditions. When we began using our first prototype, I was fortunate to speak with a trainer of racehorses who started using light therapy back in the mid '80s. He said," If he gets sore, don't stop, that means it's working." He uses light therapy not only for injuries, but as a regular part of his daily training program. Many of our clients incorporate the use of "Gospel's" Light Therapy pads as a regular part of their daily training program. It is another tool to help keep your partner in top shape. Click here to see what some of our horse clients have to say about Equine & Canine Light Therapy and Click here for opinions from our dog clients! Lasers in Surgery and Medicine 9:1-5, Mayo Clinic, Rochester, Minnesota, 1989).